Martin Doudoroff is at it again. The cocktail enthusiast and tech expert behind popular recipe apps like PDT Cocktails and Beachbum Berry’s Total Tiki (read more about him in our profile) has completed his fifth release, now available on iTunes. The subject? David Wondrich’s Punch: The Delights (and Dangers) of the Flowing Bowl. Just in time for the holiday season, the app will be a helpful tool for those looking to entertain large crowds, as it features a whopping 64 recipes spanning six centuries, including hot and cold punches. 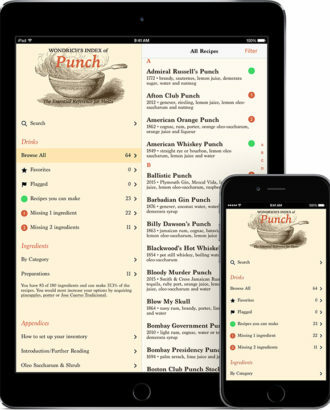 Doudoroff recommends the Philadelphia Fish House Punch and the Artillery Punch as favorites, but he also notes that most of the recipes in the app are flexible and accommodate variation. “Once you’ve made a few, you can confidently adapt and tweak, using any of the recipes here as a template,” he says. Features like the ingredient checklist and criteria filters help make it easy to identify which recipes you can make at home, and ingredient definitions are also included for some of the most obscure inclusions. The app costs $9.99, and is available in the Apple app store now. Hibiscus steals the show in this simple mezcal cocktail from Mexico City.